Private John Bell of the 14th Battalion, London Regiment (London Scottish) died on 7th November 1915, aged 31 years. His grave is one of 304 War Graves (of both the First and Second World Wars) in Comely Bank Cemetery. Many of the servicemen and women who are buried here would have died in one of several local military hospitals. John Bell did not, however, die in hospital or on the battlefield – he was shot on the night train from London to Edinburgh! John Bell was a local lad who was born at East Pilton in the Parish of Cramond. The 1901 Census shows him as living with his parents, Charles and Elizabeth Bell at East Pilton Cottages on Crewe Road. His father Charles was the Farm Grieve (a supervisor or foreman) at East Pilton Farm. John himself was shown as being a baker – presumably an apprentice baker as he was then only 15 years old. He seems to have had a later change in occupation as according to the Edinburgh Evening Dispatch of 9th November 1915, he was, before enlisting in the Army, a butler in the household of a naval officer in the South of England. On the evening of 6th of November 1915 he went to Euston Station in London and joined the 11.30pm train to Scotland. This train would have served both Edinburgh and Glasgow – the train would have been divided when it reached Carstairs in Lanarkshire. He was going on leave and had notified his family of his impending arrival. His parents at that time lived at 3 Wardie Steps. He was probably planning on arrival in Edinburgh at Princes Street Station to take the first available train on the Leith Branch of the Caledonian Railway to Granton Road Station – which was only a short distance from his parents’ home. The Edinburgh newspapers reported that he had a ticket to travel to Forfar and was planning to go to Edzell. No information has come to light about why he was going to Edzell. The train on which he travelled was not some scruffy old troop train. It was the regular night train to Scotland on what is nowadays called the West Coast Main Line. It was composed of modern coaches arranged, as most British trains were until the later years of the twentieth century, in compartments connected by a corridor. It seems not to have been too crowded as John Bell and a sailor were able to get a compartment to themselves. They each took one side of the compartment and lay down on the cushions to try to get some sleep on the long journey north. Travelling in the next compartment were two Belgian soldiers, a sailor and Private William Cairns of the 9th Seaforth Highlanders. The train set out on its long journey north and Private Cairns got into conversation with the sailor and started explaining to him the mechanism of his rifle. One of the Belgian solders later said that he had seen Private Cairns kneeling with his rifle pointing to the cushions behind the seats and with his finger on the trigger. Shortly afterwards there was a loud explosion as a shot was fired. It is not known exactly where the train was when the fatal shot was fired. Apparently someone did look into the compartment shortly afterwards but concluded that both John Bell and the sailor were fast asleep. When the train was passing through Lamington, two stations to the south of Carstairs it was realised that John Bell was dead. The train continued to Carstairs where it would have divided into two portions – the front one going on to Glasgow and the rear one to Edinburgh. When the train arrived in Edinburgh, the Edinburgh City Police removed the body to the City Mortuary where it was examined by Professors Harvey Littlejohn and Lorrain Smith –the Professors respectively of Forensic Medicine and Pathology of the University of Edinburgh. The police also located John’s family and one of his brothers went to the City Mortuary to identify him. On 10th November his parents placed an announcement in the Edinburgh Evening News to the effect that the funeral would take place at the Trinity United Presbyterian Church (more correctly Wardie United Free Church, now Wardie Parish Church) on 11th November at 3pm and then on to Comely Bank Cemetery where we can still see his gravestone. Meantime Private William Cairns had gone to visit his sister in Uddingston in Lanarkshire. His leave was cut short when the Lanarkshire Police turned up at his sister’s house to arrest him. 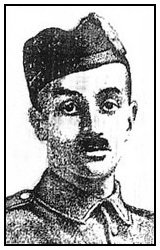 On 14th December 1915 he appeared in the Lanark Sheriff Court on a charge of culpable homicide. He pleaded not guilty and his defence was that the bullet that had caused John Bell’s death was not fired from the compartment that he was in and that the cartridge that he had in his rifle had been emptied of its explosive charge. The two professors gave evidence to the effect that the bullet had entered from the front and exited from the back of John Bell’s body. It seemed to be assumed that John Bell had been lying with his back against the compartment wall and no-one seems to have considered the possibility that someone had moved him. After ten minutes deliberation, the jury returned a verdict of Not Proven, and Private Cairns was free to return to the fighting. So far as is known, the Police did not investigate any alternative explanation for John Bell’s death. He is also commemorated on the War Memorial of Wardie Parish Church.